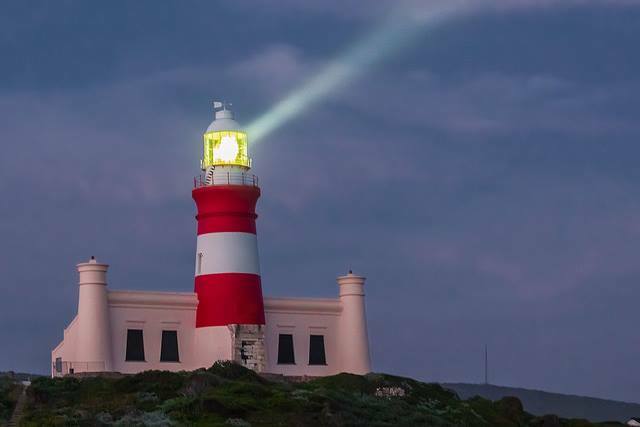 The 11 million candlepower beam of the L’Agulhas Lighthouse can be seen shining over the dark ocean for 30 sea miles on a clear night. This majestic lighthouse is at the legendary “Foot of Africa” where the cold Benguela current of the Atlantic Ocean and the strong Agulhas current of the Indian Ocean meet. It was the third lighthouse built in South Africa and is the second oldest working lighthouse. It was built in 1848 in the Pharaoh style and has very recently been refurbished. The lighthouse now houses a restaurant, gift shop and the only lighthouse museum in South Africa. The koppie behind the lighthouse provides a panoramic view of where the two oceans meet, ships pass and whales play.